The sultry temptress of Fritz Lang's Scarlet Street and The Woman in the Window, Joan Bennett dons spectacles and a harried mien as a respectable mother in a California coastal town. Family life is proving nettlesome, what with a husband traveling the globe on business, a teenage son drawn to inappropriate states of attire, and two live-ins, a father-in-law and a cook/housekeeper. The nettle-in-chief, however, is her handful of a daughter (Geraldine Brooks). Like her predecessor Veda Pierce, she fancies herself a worldly woman and has taken up with a penniless but pretentious lecher, who winds up dead. Bennett's battle to cover up the death becomes the story's meat. 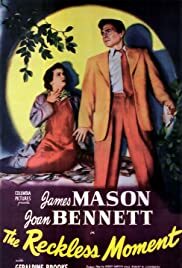 Into the mix ambles James Mason, wanting $5-grand for incriminating love letters.... Mason, with an Irish lilt, is the film's most intricately shaded character (and he gets top billing) but Bennett delivers a controlled, expert performance, possibly her finest. The star of The Reckless Moment, however, is the great Max Ophuls (though the directorial credit has it "Opuls"). Displaying evocative chiaroscuro -- Burnett Guffey was cinematographer -- and voluptuous slow takes, Ophuls creates a rich texture ranging from shabby seaside respectability to the grungy sidewalks of nearby Los Angeles. This splendidly nuanced work has emerged as one of the standouts of the noir cycle, its ironies so understated that their oppressive weight isn't felt until long after the film has unspooled.